Below you find an explanation of the “Accept repair fee” section in the return material form. As a point of reference to the explanation below, please be aware that if the guarantee apply to the returned product, repair work will of course always be Free Of Charge! 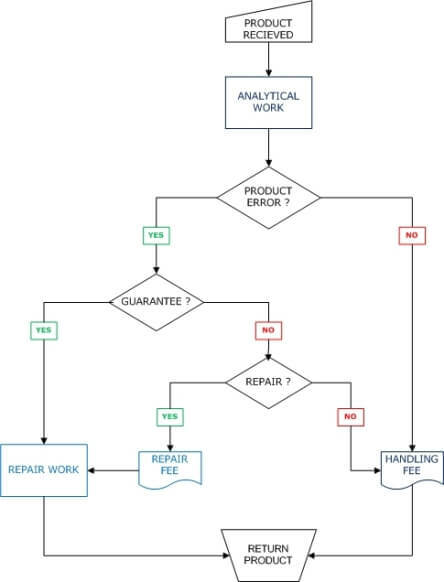 If a product error is found and the guarantee DOES NOT APPLY to the returned product, repair work will be performed, the repair fee charged, and the product returned to sender along with a report. If a product error is found and the guarantee DOES NOT APPLY to the returned product, a handling fee on 150 € per unit will be charged. Repair work will not be performed and the product will be returned to sender along with a report. In case it is decided to perform repair work the extra €150 will not be charged, but only the repair cost. The flowchart below here illustrate the way our service team make decisions. It also illustrate the differences between our repair fee and our handling fee.